I write this as I'm about to embark on the long, adventure filled journey to Churchill, Manitoba, the 'Polar Bear Capital of the World'. This will involve flights to Paris, Montreal and Winnipeg, then two days and nights on the train to Hudson Bay, through incredibly remote country. For the fourth consecutive year I'm travelling with the Great Bear Foundation, for whom ethical tourism is paramount. The character of each year's trip varies considerably, due to natural factors such as weather and the changing make-up of the group. Last year saw relatively sparse polar bear viewing but incredible northern lights displays; the signs this year are that bear activity may be greater. The backdrop to this year's trip is as poignant as ever. The Intergovernmental Panel on Climate Change recently produced a report setting out the overwhelming evidence for human caused warming of the planet, yet it seems that our political leaders are unable to look beyond their next election, and are still failing to take the decisive action which is urgently needed. Polar bears are of course on the front line of the changing climate, since they rely on the winter sea ice for their food source, seals. Their extreme specialisation makes adaptation extremely difficult, and the future of southerly populations such as those in the western Hudson Bay has to be in severe doubt, especially as warming is taking place far faster in the Arctic than the rest of the world. The Daily Mail has reported that ice coverage this year has been extensive, especially in the Berring Sea, but they have omitted to say that this is only in comparison to the extreme low last year, not to historical levels. Yet, more localised issues also give cause for concern, in particular the proposal by Omnitrax to ship 3.3 million barrels of crude oil a year north by rail to Churchill's port. The potential for damage to the ecosystem from a spill on the tundra or in the bay itself is considerable, and there is little evidence of a credible capability to mount a clean-up in such a remote area. There's also concern about the capture of wild bears around Churchill for 'conservation' in Assiniboine Zoo, and controversy about the possible impact on male birth weight of the handling of bears for research purposes. Less than a week ago came the news that two people in the town of Churchill had been injured, resulting in two polar bears being shot and a cub orphaned. 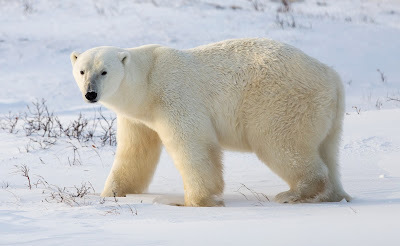 Whilst polar bears are not naturally more aggressive than other species, the Guardian has suggested a possible link to the shortening of the sea ice season and bears seeking food on land. Churchill has long struggled with the conflict between these large predators and human activity, including tourism. This followed an incident in September where a man narrowly escaped a charge from a polar bear in Churchill. Such stories can easily be misinterpreted by the media, who demonise the bears, when in fact it is humans who are encroaching on their habitat. I hope to report further on some of these issues following first hand observations in Churchill, and on my return post some photographs of my travels, hopefully including some bear sightings.